Venezuela is in a constitutional crisis. At present, there are two presidents and two governments. One government is headed by President Nicholas Maduro who was re-elected in a disputed election last year. The other government is led by the President of the National Assembly and opposition leader Juan Guaido, who has declared himself as interim president and promised free and fair elections. Although it was the inauguration of President Maduro on 10th January for a second six-year term that triggered the crisis, it has a long history. Since 1830, when Venezuela seceded from the Gran Colombia to become independent, it is plagued by political instability. There have been military dictatorships in Venezuela and civilian presidents who decided to become dictators. Even the discovery of one of the largest oil reserves in the early twentieth century and the subsequent economic boom did not result in democratic maturity. The most stable period in Venezuelan political history was from 1958 to 1998 when Puntofijo Pact was operative. Like the Charter of Democracy, signed by Nawaz Sharif and Benazir Bhutto, Puntofijo Pact was an agreement to set the rules of the game in the political arena and stop the ascendancy of anti-democratic forces. The pact resulted in political stability and continuity of democratic setup but it also ensured that only two parties dominate Venezuela for forty years. after decades in power, these two parties became complacent and instead of promoting the welfare of the people, they won elections on the basis of political patronage and corruption. Popular dissatisfaction with the two parties’ “muk muka” (Puntofijo Pact) led to the election of President Hugo Chavez, who called for a revolution to end poverty, eradicate corruption and return the power to the people. Charismatic President Chavez can be compared to Zulfiqar Ali Bhutto. He ruled with an iron hand but was loved by a large section of society. Chavez promulgated a new constitution in 1999 which gave more rights and powers to the people (free education up to university, free health, the power to recall the President and make policy through referenda) but also gave himself more powers. The Presidency became very powerful in comparison to the legislative and judicial branches. President Chavez started many schemes to help poor and indigenous people, introduced price controls and nationalized industries. All these reforms were financed by massive revenues from oil exports as he made few efforts to diversify exports and his socialist policies discouraged business investment. Chavez’s popularity allowed him to ignore any objections about the non-viability of his economic vision. When President Chavez died in 2013 and Vice-President Maduro was elected president, signs of economic deterioration were already visible. President Maduro is neither as charismatic nor has the political skills of his predecessor and these weaknesses were exposed early. After 2014, the global oil price collapsed from around one hundred dollars per barrel to below forty dollars per barrel. The Venezuelan economy could not sustain the extravagant policies or subsidies at such low oil prices. It has shrunk every year since 2014 and the IMF estimates that it has shrunk by 18% in 2018. Venezuela is also experiencing hyperinflation and its currency is now worthless. Hyperinflation and shortage of food supplies, which are mostly imported, has led to mass migration to neighbouring countries. According to the UNHCR, more than two million Venezuelans are refugees in Brazil, Colombia, and other South American countries. 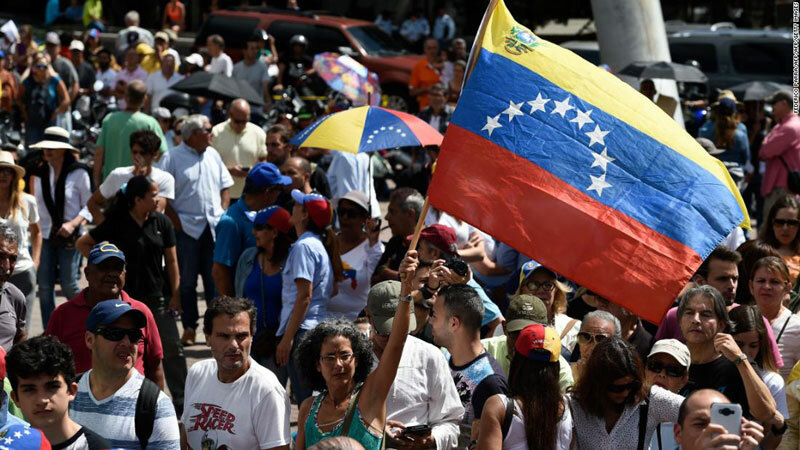 The dire economic conditions and the fact that the opposition had boycotted the last presidential elections had not left much legitimacy for the Maduro government. Therefore, when Mr. Guaido declared himself interim president, most of the regional countries and international players recognized him. The United States was always against President Maduro but Canada, European Union, and the Organization of American States have also recognized Mr. Guaido as interim president and promised support. The removal of President Mudaro, however, is only possible if the military refuses to back him. The Venezuelan crisis has lessons for Pakistan. First, economic recession and collapse can endanger political legitimacy. Governments have to ensure investment, employment, and economic growth. Second, focusing only on the groups that vote for you cannot lead to political stability. Once a political party comes to power, it must expand beyond its base and take care of all the sections of the society.